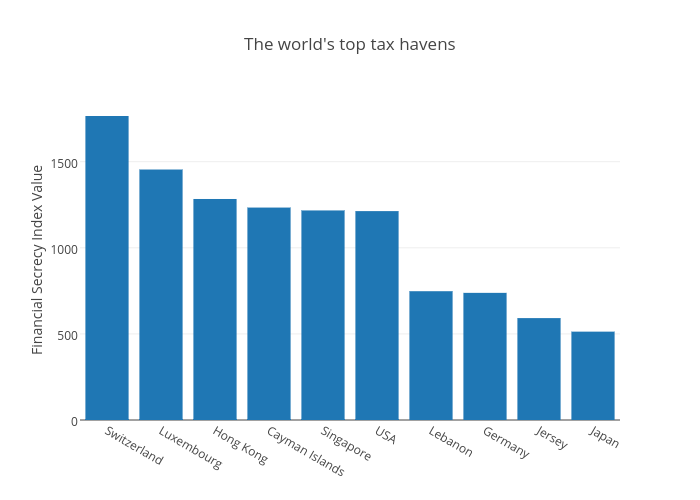 Mapped: The world's biggest tax havens | City A.M.
After the news that HSBC's Swiss private banking arm helped customers evade millions of pounds in tax, the news that Switzerland is the world's biggest tax haven will be unsurprising. The Financial Secrecy Index, which is completed by the Tax Justice Network and ranks the world's 82 largest tax havens, is based on two factors - a territory's financial secrecy score, and its share of the global market for offshore financial services. The list places Switzerland top, followed by Luxembourg, Hong Kong, Cayman Islands and Singapore. Samoa is the most secretive state on the list, with a score of 88 out of 100. This is based on fifteen factors, including banking secrecy and company ownership records. Samoa accounts, however, for less than one per cent of the global market for offshore financial services. The USA is top for the global scale weight, with a share of 22.6 per cent in global financial services exports. Second on the list is the UK, with an 18.5 per cent share. Of the list of 82 states listed, 10 are British overseas territories and nine more are British commonwealth territories whose court of appeal is the Judicial Committee of the Privy Council in London. If viewing on a mobile device, scroll to the right of the map to go past it. Of the list's top five, Switzerland, Hong Kong, the Cayman Islands and Singapore each have a share of around four per cent in global financial services exports. Luxembourg's share, however, is much higher, at 12 per cent share. Switzerland has the highest level of secrecy among the top five havens, with a score of 78 out of 100.